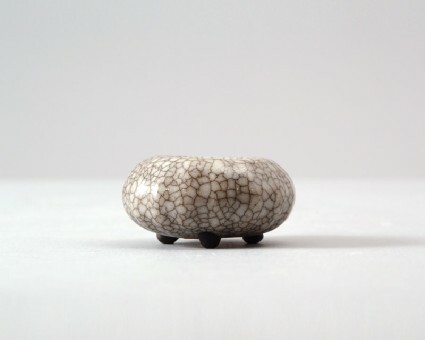 This miniature vessel copies the celebrated crackled guan (‘official’) wares of the Song dynasty (AD 960–1279). The piece is of depressed globular form, with a wide circular opening, the sides densely lobed and resting on three tiny dot-shaped feet. The piece is covered with a grey glaze with a stained crackle, the feet are unglazed and show a black body.